This book examines when, how and why internationalization affects national economic institutions. 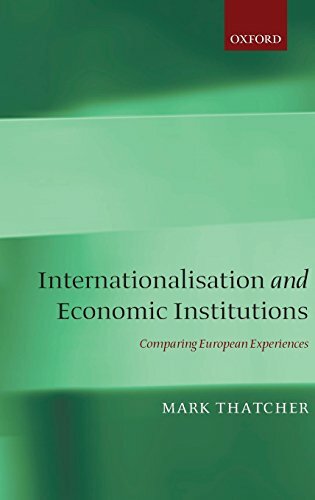 It confronts questions at the heart of debates in political economy and comparative politics: What does internationalization of markets mean? Who are its carriers in domestic arenas? Through which mechanisms does it affect decisions about national institutional reform? What are institutional outcomes in the face of internationalization? The book responds to its questions by looking at key economic institutions in five strategic sectors: securities trading, telecommunications, electricity, airlines, and postal services. It compares across four countries that represent different 'varieties of capitalism', namely Britain, France, Germany and Italy, over the period between 1965 and 2005. Thus it combines cross-national, historical and cross-sectoral comparisons. The author distinguishes technological and economic forms of internationalization from policy forms, notably decisions in powerful overseas nations and supranational regulation. He argues that, contrary to expectations, the first was met with institutional inertia. In contrast, policy forms of internationalization, namely reforms in the US and European Union regulation, played significant roles in undermining long-standing national institutions. The book explores the mechanisms whereby policy forms of internationalization were influential by looking at the strategies, coalitions and resources of key actors in national arenas. It also shows that institutional outcomes were surprising: all four countries, albeit through different routes, adopted increasingly similar reforms of economic institutions--privatization, the ending of monopolies and delegation to independent regulatory agencies. The book rejects the view that technological and economic forms of internationalization drive institutional change. It suggests that policy forms of internationalization are more important because they become part of domestic decision making and aid the reform of well-established national institutions.